One question I tend to get asked quite often is how do you get the perfect group shot with 3 or more dogs. My answer is usually with a lot of patience, treats, toys, and it always helps if the dogs are well trained. Every dog is different and may not be motivated in the same way as another. For instance one or 2 dogs may be ball motivated while the others are treat motivated. You have to find the right balance in order to get the dogs to stay together. Another key role that takes place when attempting a group shot is the owners. It always helps when they are able to set up their dog for the shot. 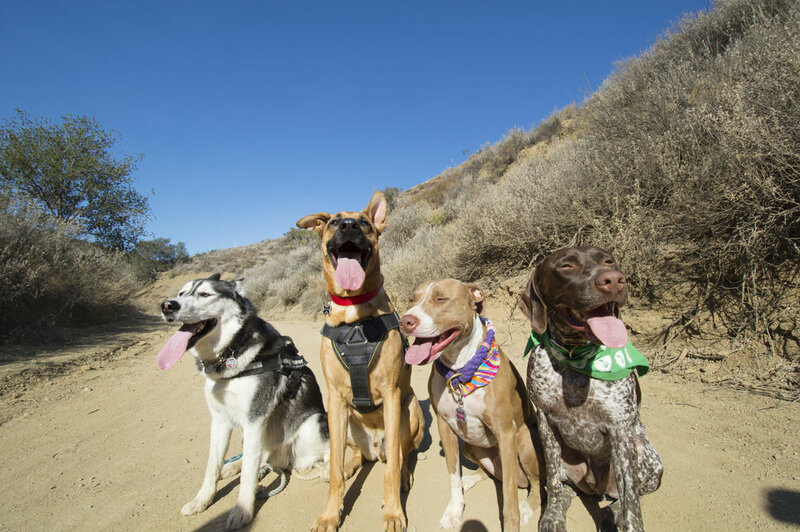 If I have multiple dogs with different owners I have them line up the dogs one by one in the spot for the photo while I am already set up and ready to snap the shot by the time the last dog is put in position. Something else I like to do is have the best well-trained dog sit in the middle. This dog acts like the anchor and by that dog being in the center it helps others that may break their sit/stays hold still long enough for me to get a photo because the anchor dog hasn't moved yet. If that doesn't work then I usually have the dog(s) with the weakest stay be in the middle this way they are sandwiched in by the dogs that won't move. I also get asked how can you get all the dogs to look at you at one time or at least in the same direction and my answer is waiting. Sometimes I will make silly noises and that will work on a few but not all. I also use treats and squeaky toys, but mostly it is just waiting for that perfect shot. Group shots can be a challenge but they always end up being a lot of fun and have some pretty cool results!